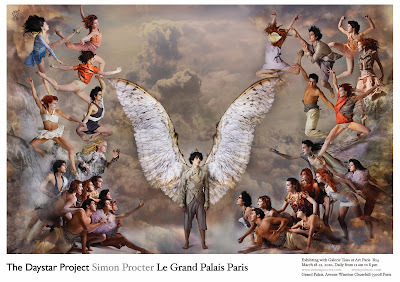 Paris-based Simon Procter is one of the world’s most renowned fashion photographers, but his glamourous lifestyle today is a long way from his working-class roots in a small industrial village in the North of England. I talked to him about his unusual journey, and about how he is trying to transcend the fashion genre to create truly great works of art. “A long time ago I wrote a poem called Lockwing, which was about the swift. It's a bird that can lock its wing and sleep while still flying, and I wondered what it would mean to be a creature that had no nationality and no need for contact with the earth”. Dividing his time between New York and Paris, as well as on location shoots across the globe, Simon Procter is seemingly in the perfect position to answer this question. As yet though, it is an enigma that he has not solved. The name Lockwing has also been given to his studio space in Paris, as well as to a mysterious ongoing project. "We are not sure what the Lockwing Project is yet" announces the website he has set up in this name, and when I ask him directly he is no more forthcoming; “I’m afraid you will have to wait and see where that one goes” he explains, “it’s a bit confidential at the moment”. Will it be his life-defining project? Procter's artistic progression has been a curious mixture of intense self-belief with splashes of serendipity, but when speaking to him it is clear that he is constantly questioning his work and attempting to move back the boundaries of his discipline(s). 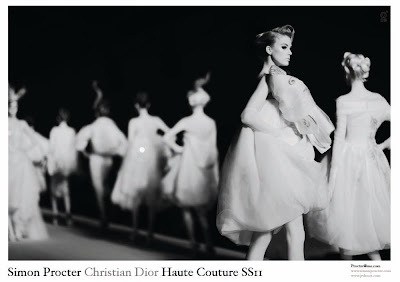 His creations - often based around monumental and dramatic compositions - have been described as “a unique synthesis of classical painting and fashion photography”, but this is a label he refutes. He is happy to keep the ‘unique’ tag, pointing out that he is always “trying to do something that no one else is doing”, but seems annoyed to have his work thought of as some kind of fusion. “My work is not a pastiche or a reference to the great classical art works. I am truly trying to produce things of that level” he explains. For Procter, though, the more relevant question was the one posed at the end of the article; "it may be art, but is it photography?". As Procter has himself admitted, "most of the time I don't consider myself to be a photographer". He is working on projects that involve both painting and photography, and is a thoroughly modern artist, tacking along the digital line that today blurs traditionally distinct artistic boundaries. The reason behind his approach may come from his background. Procter is classically trained. He studied fine arts, and for many years concentrated purely on painting and sculpture, considering photography to be a discipline for the rich. His drift towards photography was part accident and part design, but he believes that his wider training has given him a certain edge. “There was a whole genre of painting that was not really relevant to me when I studied Fine Art. But once I started taking photos something - a whole tombe of composition and pictorial structure that I was trained to understand and analyse - clicked. This was a massive advantage” he explains. His vision may have developed early, but just how did he land in Paris and the fashion world? Following his art school studies, Procter explains that he did many things, and lived most of his adult life without very much money, which although "a bit exhausting and scary at times" was also a way of life that he "always believed to be for the sake of something". After drifting to Paris, his break came following a chance meeting with “a wonderful guy called James Kaliardos (one of the founders of V magazine) who really supported me without asking for anything in return”. At the same time he stumbled into the fashion world, which he describes as "a very strange land, much stranger than people realise", but also one which changed his life. The world of fashion gave him freedoms that he had never had before. "I had rather naive but very strong ideas about what an image should be, and by sheer chance I was put in a situation where this had great value. One day I was worrying about having enough money to buy batteries for my 10 dollar flash on my first V magazine shoot and five weeks later I was shooting the Nike global advertising campaign. The speed is the most fascinating and exhausting thing about fashion". Simon Procter may be one of the key movers in this industry today, but he remains something of a non-conformist. When I ask about his influences, he mentions 19th century French artist Gustave Doré, whose work he describes as "very immediate, very graphic", but he also lists a far more surprising influence. "On a personal level the class stuggle in britain is a darkness that touches in an oblique way" he explains. "I think there is a whole generation in the north of my country that has been neglected and utterly forgotten. My brothers do not have the same life as me". 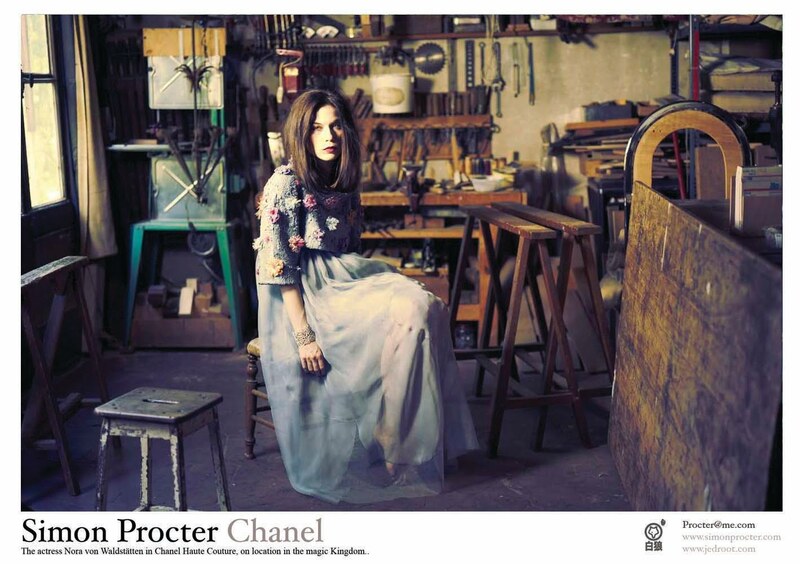 When I ask if this is not a little incongruous in the elitist world of the fashion industry, Procter hesitates. "I think its mainly an outlook on the world, seeing both the bottom and the top. 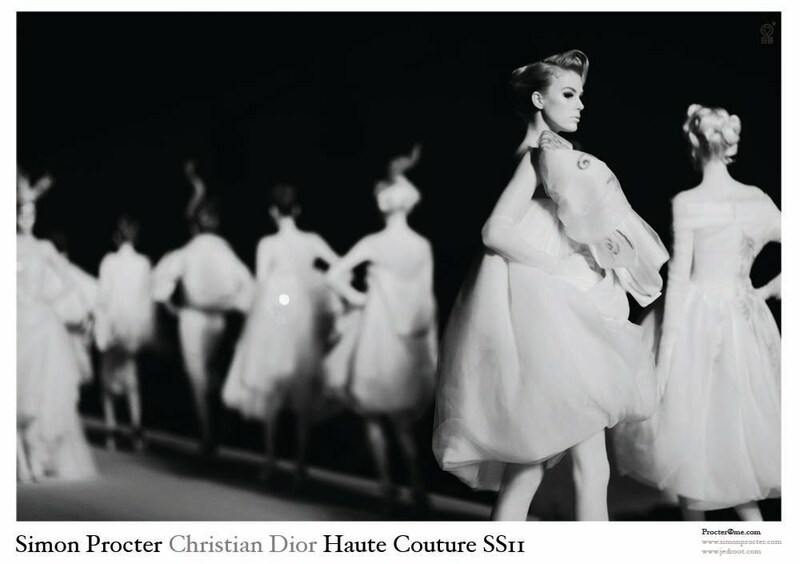 The consumption of luxury brands may be elitist but the creative forces and ideas can come from anywhere" he explains. Some of his recent photoshoots back up this theory. 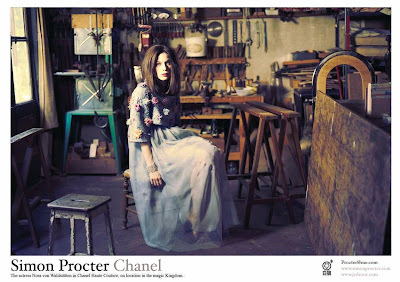 A Chanel project was snapped in the workshops of the artisans who live and work alongside Procter, but above all, it is his series 'Death of a Painter' for Christian Dior Haute Couture that gives an insight into this world-view. The shoot is the recreation of the 'life, art and death' of Procter's aged painter-neighbour, a lady called Rolande who had befriended his young daughter. It is a difficult subject matter, and one that could be deemed in bad taste in the wrong hands, but with the elegance and craft of Procter's photography it stands as a haunting eulogy. Simon Procter's vision and motivations are undoubtedly complex, as are his often hyperreal airbrushed photographic compositions. 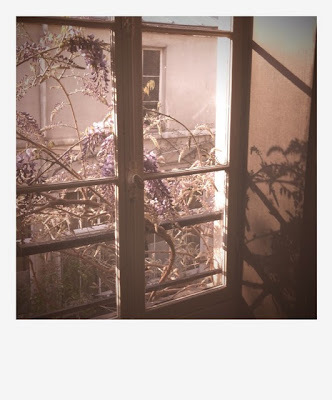 Perhaps as an antidote to this existence, he also runs a blog called ‘Under Lutetia’ which focusses mostly on Paris and features much more intimate and personal photography shot entirely on his iPhone. When I ask him about it, he seems almost surprised. "I didn't think anybody else looked at it" he says. However, it is perhaps here where the real Simon Procter can be found. "It's more a kind of diary for myself" he explains. "Its not very glamorous. I think it's about what it is to be human". It's a subject that Simon Procter seems to know a lot about. 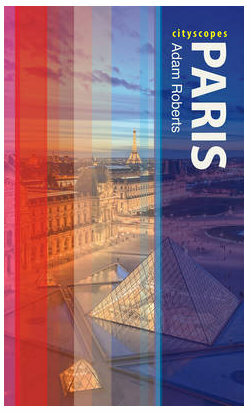 "I love Paris, I truly love Paris. I have grown up in Paris, but always with - and as - a bunch of outsiders, who dont know much about St Germain and the Latin Quarter. I live in Belleville - a kind of china town in the east of the city - and it’s a wonderful place. There's duck drying on the balconies, and you can see live eels for sale in the street. Everywhere is energy and industry, but no one has a free ride here. My recommendations for visitors are always the same. Everyone once in their life should go to the menagerie in Jardin des Plantes and see the snow leopard. After that a bowl of soupe satay sans boulettes in the vietnamese Tin Tin restaurant just next to the Belleville crossroads". Brilliant inteview, you captured his art masterfully! He's absolutely right, Bellville is a wonderful example of the real Paris where socio-economic backgrounds and ethnic cuisine converges. This is a talented interview of a talented artist! 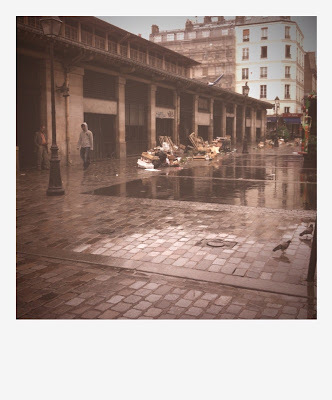 I suppose you met at Grand Palais ... and that it's now too late to ses the Daystar Project? Too bad. There may be different opinions about this type of photo work, but I think what he has produced in a Michelangelo fashion is just fantastic and spectecular! ... and so different from what you can see on his more "private" blog! Bravo ... to both of you! !